Personal pizzas make a great quick lunch or dinner! We make ours by using leftover homemade soaked tortillas. But you can easily make these using your favorite wholesome tortillas. 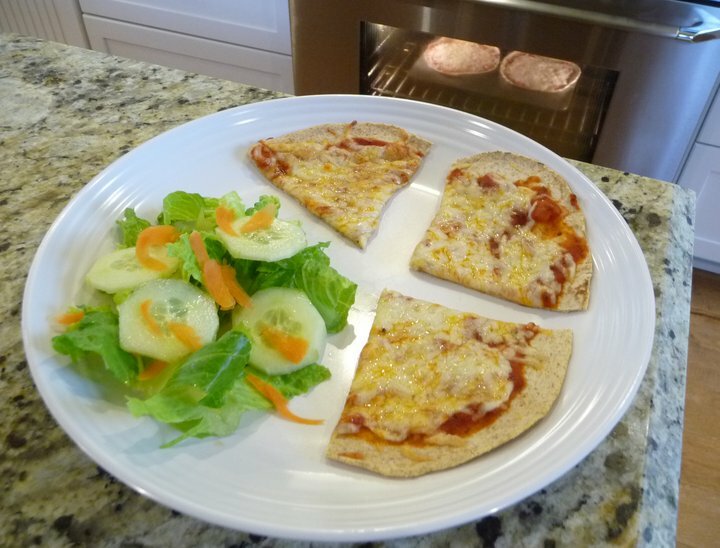 These little pizzas are so quick and easy to assemble – they’re a great way to get your Kids in the Kitchen with you! The options are endless when you make your own homemade personal pizza! 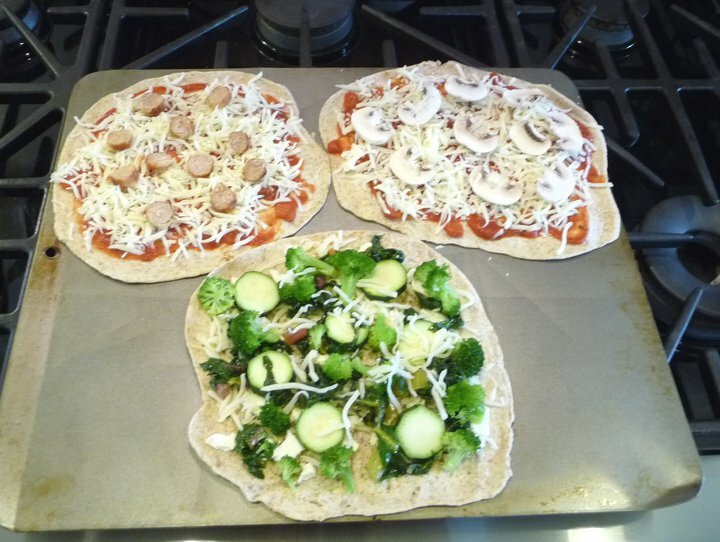 Shown above: Chicken Sausage, Marvelous Mushroom and my personal favorite, No Sauce Veggie! Preheat oven to 400 degrees. Place tortilla on ungreased baking sheet. Spread evenly with organic pizza sauce and sprinkle with mozzarella cheese. Bake approximately 8 minutes. Yum! Preheat oven to 400 degrees. In a small bowl, mix together olive oil, seasonings and salt. Brush oil mixture evenly across top of tortilla. Crumble some feta cheese and sprinkle with a little shredded mozzarella. Top with your favorite organic veggies (spinach, zucchini, broccoli, etc.) and another small sprinkling of mozzarella cheese. Bake for approximately 8 minutes. Veggilicious! Preheat oven to 400 degrees. Evenly distribute BBQ sauce on top of tortilla and sprinkle with some shredded mozzarella. Top with diced grilled chicken, your favorite veggies and another small sprinkling of mozzarella cheese. Bake for approximately 9 minutes. A BBQ-lover’s delight! Preheat oven to 400 degrees. Brush olive oil evenly across top of tortilla and add a dash of freshly ground pepper and salt. Then sprinkle with some mozzarella cheese. Thinly slice leftover steak and lay across top of cheese. Sauté some sliced onion with some sliced organic green and/or red bell peppers in a little olive oil, until al dente. Add to top of steak. Top with some sliced mushrooms and another small sprinkling of mozzarella cheese. Bake for approximately 8 minutes. A steak lover’s dream! I love in the spring when the asparagus is fresh and I found a recipe for asparagus, ricotta pizza with a lemon vinegarette. Also the kids love barbecued pulled pork with thinly sliced peppers, onions and cheddar cheese and Taco pizza.